All berries are awesome! They are delicious super-fruits that are easy to enjoy on a regular basis. The first thing I think of when I think of berries is their antioxidant dynamism. Berries contain an extremely wide range of antioxidants. Antioxidants protect cells and DNA from damage and oxidative stress – this type of cellular damage is linked to neurodegenerative diseases, cancers, cardiovascular disease and diabetes, to name just a few. Protecting our cells and our DNA is extremely important for health, vitality and longevity. The full potentiality of berries and their diverse phytochemical constituents are still being discovered. All berries are a rich source of flavonoids. Flavonoids are water soluble, yellow-thru-purple range antioxidant pigments. Flavonoids are metal chelators and very powerful antioxidants that work synergystically with other antioxidants, like vitamins C, E and beta carotene. Flavonoids are antioxidants for other antioxidants (super cool!). Flavonoids are cell-protective. Robust, properly functioning, healthy cells are required for overall health and aging resistance. Flavonoids have anti-inflammatory effects throughout the body, they fortify the immune system and support nerve function. Research continues to show new ways in which flavonids benefit the body and amplify the benefits of other nutrients as well. Some berries also contain carotenoids. Carotenoids are fat soluble, yellow-orange-red range antioxidant pigments. Carotenoids too, are cell-protective and their potent antioxidant and anti-inflammatory activity has great anti-carcinogenic, immune supportive and eye and heart protective potential. One of the more commonly known carotenoids is beta-carotene which is known for it’s immune boosting and skin nourishing qualities. Like flavonoids, research continues to find encouraging and exciting health supporting characteristics of carotenoids. Apart from these various phytonutrients, berries also contain vitamins and minerals, which should not be overlooked. Vitamins and minerals are required in EVERY process and by EVERY system and EVERY organ within the human body. Maintaining adequate levels of the basic lettered vitamins and the major and trace minerals should not be discounted but rather, honored and respected. I have found that some people have an aversion to berries and other fruits with concerns about sugar content, when in fact, berries have a low glycemic load. Some studies are now showing that berries may actually help to balance blood sugar levels. I’m of the belief that when eating a healthy and intentional diet, the fractionated details and ratios are less important than the variance of nutrients and inclusion of a variety of both fruits and vegetables on a daily basis. When possible, choose organic berries. Conventionally grown berries are heavily sprayed with pesticides, herbicides and other harmful chemicals. I support organic farming for it’s direct risk reduction to my own health but also to protect the health of the soil, the farmers, the water sources and the interconnected ecosystems within our beautiful planet. Organic berries also tend to have significantly higher nutrient value and antioxidant activity than conventionally grown berries. Berries come fresh, frozen, dried, powdered, and in juice. Frozen berries maintain a high level of their nutrients if frozen within a short time after picking. During the northern winters fresh berries have to travel very far, significantly reducing nutrient levels and overall quality while raising consumer cost and carbon emissions. When berries are out of season I choose trusted-brand, organic, frozen berries and in the summer months I freeze my own to eat in the winter. Dried berry powders are a good option when berries are only grown outside North America. There are some really great companies providing berry powders that used to be unavailable to Canadians. One gram of berry powder equals about seven grams of fresh berries. 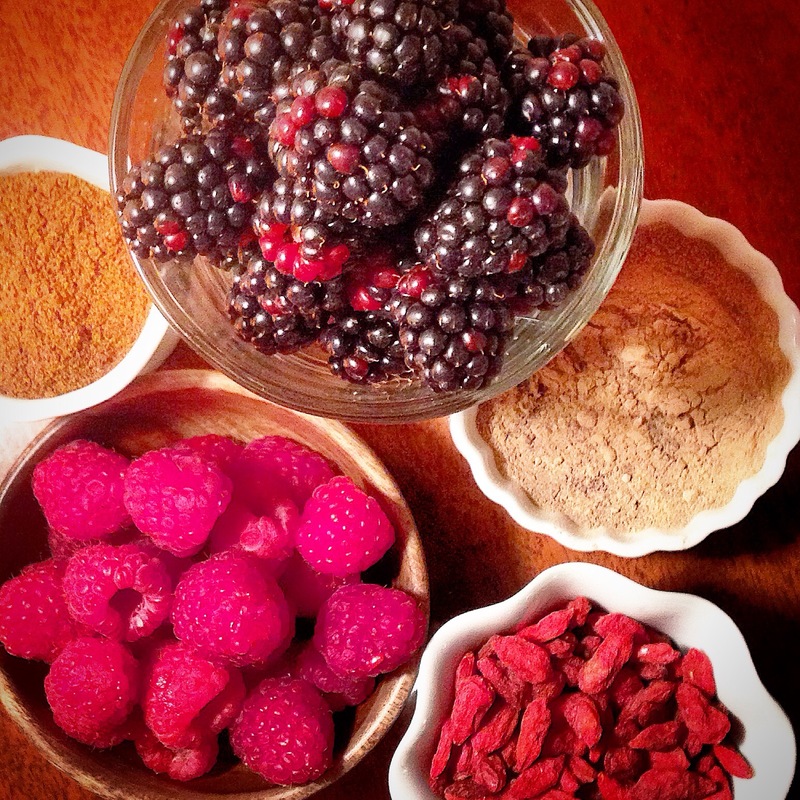 Powders are easy to add to smoothies, shakes and tonics. Dried berries are another good option. I do recommend that portion size be considered when eating dried fruit . When water is removed from fruit it is often easy to eat much more than you could ever eat fresh. Even natural sugars, when consumed in great excess, can be overwhelming to the system. Eating dried fruit with fats and proteins (trail-mixes and granolas) can reduce spikes and subsequent drops in blood sugar levels. Generally I avoid all commercial fruit juices. Raspberry cultivation dates back around 2000 years making them the earliest recorded berry crop. Raspberries are easy to find and are grown on at least five continents. They have a lovely texture, are juicy and both tart and sweet. They are especially high in fiber, vitamin C, manganese and magnesium. Raspberries contain a wide and abundant range of antioxidant and anti-inflammatory phytonutrients including the flavonoid Quercetin. Quercetin is often indicated for allergies, respiratory and cardiovascular support and may help to detox estrogen. Raspberries also contain raspberry ketones that may improve fat cell metabolism and change certain enzyme reactions to reduce fat absorption and storage. Eat raspberries on their own or add to shakes and smoothies, tea tonics or homemade vitamin waters. Raspberries are also a great berry on yogurt and steel-cut oats. Blackberries are lush, delicate, sweet and slightly earthy. They get their luscious deep purple-black pigment from one of those glorious flavonoids called anthocyanin. Anthocyanin has robust and powerful antioxidant activity. Blackberries are high in vitamin C and also bioflavonoids, more flavonoids that work as partners to vitamin C, reducing the effects of age related conditions and protecting the brain from oxidative stress. Blackberries also contain lutein and zeaxanthin, these carotenoids are especially active in the eyes and may have a major role in the prevention of age-related macular degeneration. Blackberries also contain B vitamins, vitamin K and a range of minerals. Blackberries are fantastic on their own, or in shakes, smoothies and vitamin waters, or toppings on yogurt and steel-cut oats. Goji berries are a next-level superfood. They’ve been used in Chinese medicine for hundreds of years for a wide range of conditions, but are generally acknowledged for their supreme longevity driven benefits. Goji berries are typically sold dried and are now quite common and easy to find in health food stores with numerous brands to choose from. They are chewy and a bit sour but balanced in flavor. Goji berries are adaptogenic herbs, this means that they help the body to adapt to all types of stress and help all systems to return to a healthy, balanced state – this could mean initiating a boost or a reduction, depending on what the body requires at any given time. The ability to better cope with stress also reduces strain on the adrenal glands which is a growing concern with the North American pace. Interestingly, Goji berry bushes themselves are highly adaptable. They can prosper in both desert and tropical conditions, in the heat and in the cold, and they can even withstand rapid 40 degree temperature swings! Often I have studied the qualities of a herb in nature and discovered that it directly correlates with how it interacts with and benefits the human body – I think this is incredibly inspiring an exciting! Goji berries are the richest known food source of carotenoids. As you now know, carotenoids have potent antioxidant activity and are excellent for immunity and eyesight. Goji berries are a complete protein (contain all 8 essential amino acids) and have 19 total amino acids. One of these amino acids is tryptophan, the precursor to serotonin, “the happy neurotransmitter” and melotonin the hormone responsible for sleep cycles and DNA protection. Goji berries are also the only food known to stimulate Human Growth Hormone production, which would confirm it’s use historically as a longevity herb. Goji berries contain iron and other minerals, vitamin E and linoleic acid, an omega 6 essential fatty acid. Goji berries are great on their own and in trail-mixes and granola, in yogurt and steel-cut oats. Traditionally a tea would be made from the berries. They are also great in shakes and smoothies and in raw food bars and balls. I recommend soaking them for 10 minutes to 6 hours depending on your desired consistency. The water used to soak the goji berries has nutrient value and is worth drinking or including in your shake. Camu Camu berries are available primarily in powdered form as they are grown in the rainforests of South American. The powder is golden, tangy, tart and slightly bitter. Camu camu berries are the highest known plant source of vitamin C. Just one teaspoon contains about 1200% of the recommended daily intake! (keep in mind that RDI’s are measurements based on lowest amounts required to prevent deficiency disease, essentially the bare minimums). Strong and vibrant immune fuction is always in the forefront when thinking of vitamin C. Vitamin C is also required for the synthesis of collagen, which makes it very important for cell stability, joint function, skin resilience and elasticity, and gut health. Camu camu berries also contain a range of amino acids including Serine (protein synthesis), Leucine (muscle and bone growth, hormone production) and Valine (nervous system and cognitive function, muscle tissue support). Camu camu berries are a good source of calcium, potassium and other minerals, as well as some B vitamins. They are high in flavonoids, giving them antioxidant and anti-inflammatory effects. Camu camu berry powder is good in shakes and smoothies and raw food bars and balls. It can also be added to dressings if wanting a bitter, sort of citrus-y tang. If you can not find a way to enjoy the flavor, there are also capsules filled with powder commonly used as vitamin C supplements in a whole food, easy assimilated form. Sea Buckthorn berries are another berry that has been used traditionally in Chinese Herbalism for hundreds of years. There is recorded medicinal use of sea buckthorn berries in European herbalism too. Both of these geographical locations are blessed with sea buckthorn berries growing naturally. Sea buckthorn berries are rich in carotenoids and flavonoids and also very high in vitamin C. The bark and the skin of the berry are said to contain serotonin – I know of no other botanical source of serotonin, so this idea is very exciting. Serotonin imbalances are responsible for many mental health concerns. I’m hoping further research is conducted regarding sea buckthorn and serotonin. Sea buckthorn contains many essential fatty acids including Omega 7, which is significant in the health of skin, hair and nails. It also has benefits supporting cardiovascular health and maintaining insulin sensitivity (low insulin sensitivity is associated with type 2 diabetes). Sea buckthorn berries also contain vitamin E, K and beta-carotene. Sea buckthorn berries are available dried, powdered and as a fresh berry puree. The powder can be added to smoothies and shakes. I like the powder in chilled tea drinks. The powder is quite a bold flavor, very earthy, slightly bitter and rich tasting. It is great if you prefer a less sweet smoothie. The puree tastes lighter and is good in all sorts of smoothies, shakes, homemade juice blends (new kombucha flavor?) and superfood snacks. Enjoy all of these and other berries frequently. These are only some of the most prominent healthful qualities . I’m sure new discoveries are being made as you read this that will show even greater potential held within these bright and tasty beauties. Note: Unfortunately some studies being done on individual antioxidants and pigments do not take into account the idea of wholism and synergy that exists within whole foods and nature. I am a Wholist. I believe in the great wisdom of nature and know that it’s vast intelligence cannot always be confirmed in isolated, extracted, or synthetic compounds commonly studied in laboratory scenarios. As always, please consult your health care practitioner when making decisions for your health and the health of your family. This disclaimer outlines the intention of Everything Organic Always. Previous Post Lemon Water Revitalize: Why drinking warm, salty lemon water is AMAZING!